Ducks vs. Dawgs to End the Season? 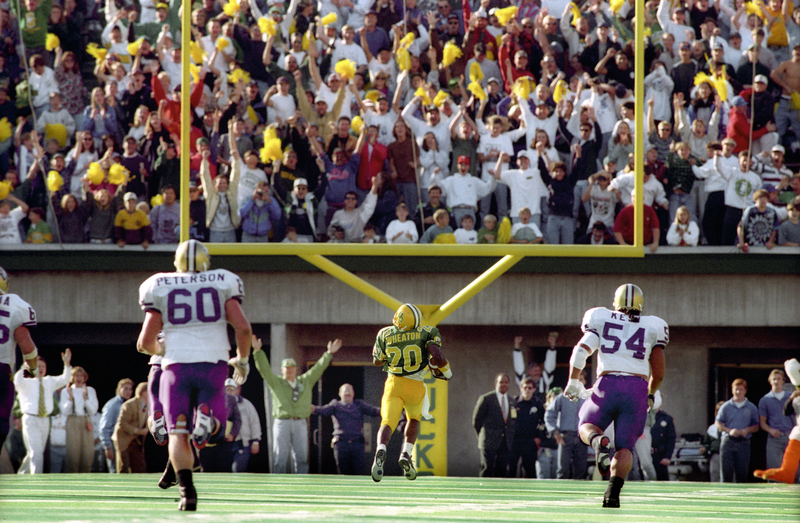 For every Oregon Duck fan, time simply stopped; maybe for only a few seconds…We all took a mental photo of that moment at Autzen Stadium, made all the sweeter because the opponent was the hated Washington Huskies. 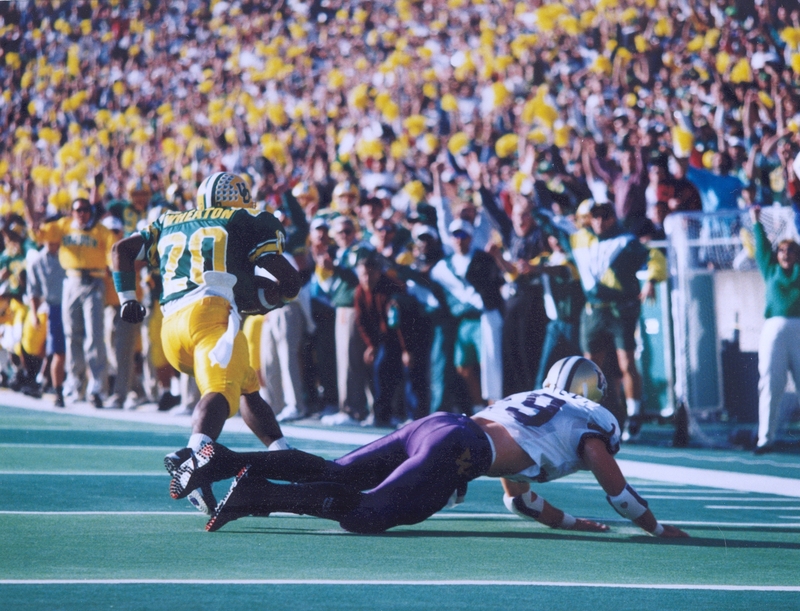 The “Pick” paved the way to the Ducks going to the Rose Bowl and it officially ushered in the Golden Age of Oregon football. Yes, my mom told me to never use the h-verb. Sorry mumsy no other word works just as well in this case. I know Washington fans harbor the same feelings about Oregon, particularly since the Ducks won the Rose Bowl and have recorded an unprecedented eight straight wins over the Huskies. We were pleased as punch to shut down Husky Stadium for a year with a resounding 34-17 win over the Dawgs as their demoralized fan-base filed out of the antiquated stadium on the lake. Washington fans are now yearning for the NCAA to crucify Oregon for the questionable use of recruiting services, maybe evening the score for the Dawgs’ years of “Lack of Institutional Control” probation back in the 1990s. Oregon fans are hoping for a slap on the wrist. Most likely the verdict is going to be somewhere in between…pleasing neither side. As a resident Duckologist, I can attest to actual conversations over adult beverages in which Duck fans were debating which was preferable: Going 1-11 and beating the Huskies or going 13-1, winning the Rose Bowl or the BCS National Championship, and losing to the Huskies? It is a nip-and-tuck on that one. What was not a close call was the one-year absence from the rivalry in 2001 because of the Pac-10 round robin at the time…Never again. All of this foreplay brings up a question that makes increasing sense as college football undergoes titanic changes, including major conference realignments and maybe even a plus-one playoff to determine the national championship. 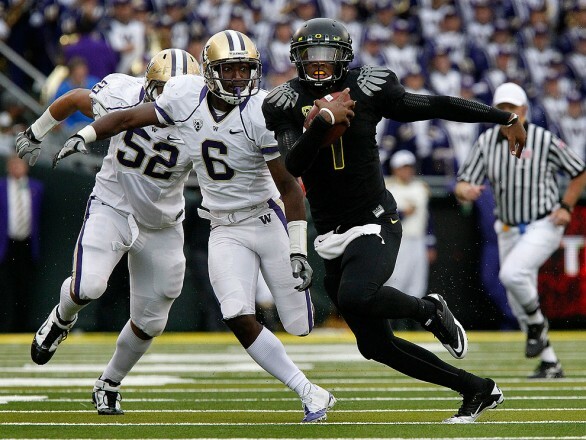 Why not have the Ducks and Dawgs play each other to wrap up each season? Sorry Civil War (Oregon vs. Oregon State). Sorry Apple Cup (Washington vs. Wazzu). These games still matter, but they can be played during the middle of the season. They just will not be the season ending games. That is actually the case for Stanford vs. Cal, which will be played on October 20 because of a Pac-12 scheduling quirk. There is actual precedent that paves the way for this meaningful change. This coming season as is the custom in all seasons, Michigan will play in-state rival Michigan State on October 20. The maize and blue with its traditional uniforms concludes each season by playing its bitter rival, Ohio State, on November 24. It is simply known as Ohio State vs. Michigan…nothing more needs to be said…everyone in Ann Arbor and Columbus understands the significance of these three-plus hours that come only once a year. If you are a Buckeye or Wolverine fan, you know exactly what you will be doing at that precise time one year in advance. If your team loses, it is a long year to wait for the next chance. No other sport dictates your personal future schedule like college football. The drive from Eugene to Seattle is 288 miles straight up I-5. The distance between Seattle and Pullman is 285 miles. The two venues are equidistant for the Huskies, but there is little doubt which opponent stirs more passion for those who wear purple and yellow as standard attire. Will there be opposition to this proposal? Certainly. The land grant negative vibes will come from Corvallis and Pullman, but the Beavs and the Cougs can play their “rivalry” game on the last day of the season as well. The winner will garner the Golden Fleece award. Wonder if the fleece will be nervous?